superimposed over a standard grid pattern.”* The majority of the Capitol Hill Historic District is composed of uninterrupted residential row homes; however, there are two main commercial corridors that run through the neighborhood: Eighth Street, S.E., and Pennsylvania Avenue, S.E. Pennsylvania Avenue is one of the grand boulevards that cut through the L’Enfant grid, creating the signature triangular parks and squares found throughout the neighborhood and the city. Source: Boschke, Topographical Map of the District of Columbia, Library of Congress, 1861. Newton E. Webb, a druggist residing at 500 Eleventh Street, S.E., owned the corner building and ran a drug store out of 1101 Pennsylvania Avenue, S.E. That same year, Webb received a building permit to put in store windows, expanding the building to the corner of the lot. This property consistently remained a drug store until it was purchased by Frager’s Hardware. By this time, single family dwellings were built at 1105, 1113, and 1117 Pennsylvania Avenue, S.E. As seen on the 1861 Boschke map, development had yet to reach Pennsylvania Avenue between 11th and 12th Streets, S.E. 1.) 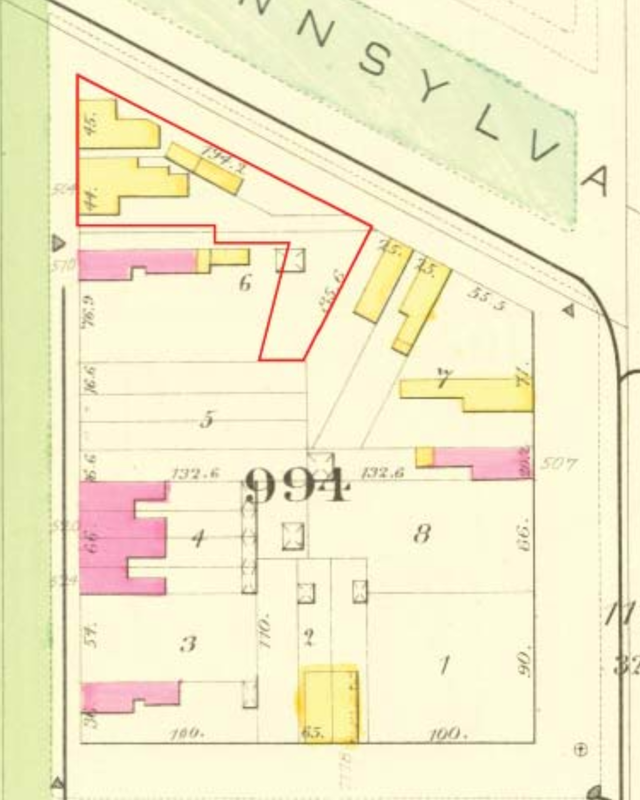 1887 Hopkins Map depicting the wood and brick buildings on Square 0994; the current footprint of Frager’s Hardware property is highlighted in red. Source: C.M. Hopkins, C.E., Complete Set of Surveys and Plats of Properties in the City of Washington, DC, 1887, page 36. 2.) 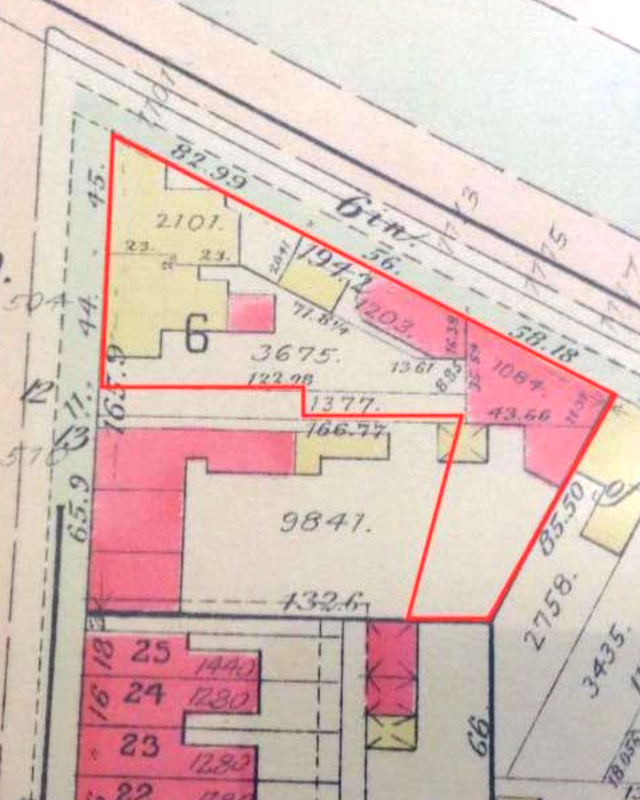 1903 Baist Map showing continued development of Square 994; the current footprint of Frager’s Hardware property is highlighted in red. Source: G.W. Baist, Baist’s Real Estate Atlas of Surveys of Washington, DC, 1903, Volume 2, Plate 30. Fritz "Frank" Frager immigrated from Russia around 1902 after traveling across Europe, where he became skilled in many languages, which helped him to be successful in business. After he was laid off from the Navy Yard, where he worked as a cabinet maker, he decided to open his own business. With only $5,000 in borrowed money, he was able to open a hardware store 11 blocks from the United States Capitol in 1920, where it still stands today. The family lived above the store, as was common in those days. The business was became so successful that they were able to expand the store during the Great Depression. After Frank died of a heart attack in front of the building, his sons, George & Jules, who worked in the store since childhood, ran the operation for many years. They eventually grew tired of the daily grind and decided to put the store up for sale in 1969. However, it wasn't until 1975 that the operation would change hands. Fitz Frager opened a small hardware store in the southeast unit of Fealy’s building at 1105 Pennsylvania Avenue, S.E. Fritz “Frank” Frager was born in Russia in 1883 and immigrated to the United States in 1902. Frager originally worked in his uncle’s grocery store in northeast, until his uncle was murdered. He then moved to southwest Washington, D.C., and worked as a cabinet maker. By 1921, Frager had moved to 431 Eleventh Street, S.E., and opened his hardware store in the southeast storefront of Fealy’s new building. The first location of Frager’s Hardware was at 1105 Pennsylvania Avenue, S.E., established in 1920. The corner buildings on Lot 6 were purchased by Martin S. Fealy, who demolished the previous structures and constructed the existing two-story brick building. Frager purchased the Lot 33 at 1115 Pennsylvania Avenue, S.E., He obtained a permit to tear out the front and rear walls of the building in November and an excavation permit in December. Frager began construction on the new building in December of that same year. to the front of the newly completed building, while Frager moved into the apartment in the rear of the building. Frager expanded the hardware store to the building next door. He purchased 1113 Pennsylvania Avenue, S.E., and razed the building in early December. 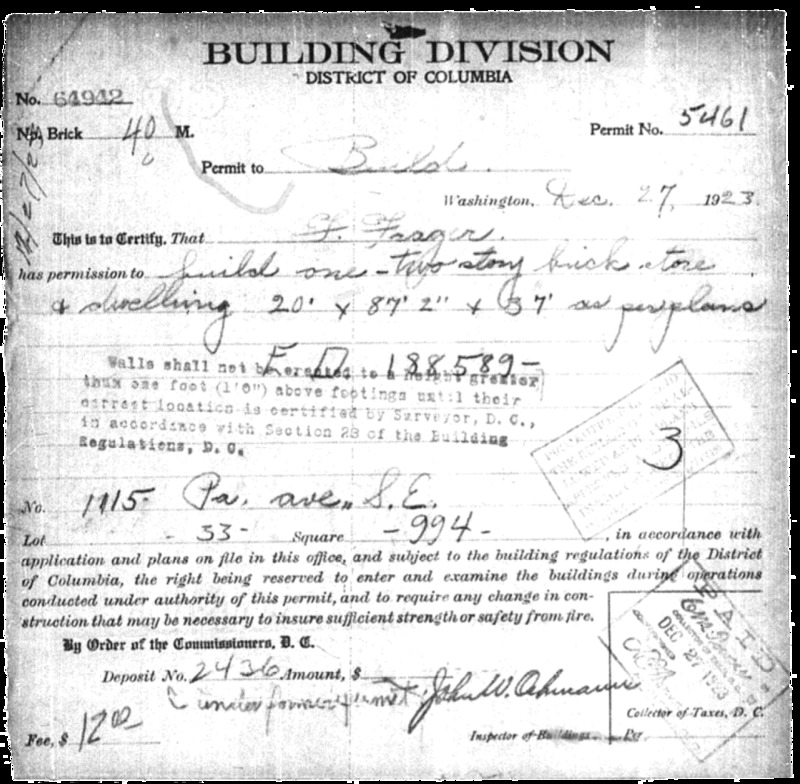 Frager again hired Wenig to construct a new building at 1113 Pennsylvania Avenue, one that would look contiguous with 1115 Pennsylvania Avenue, S.E. The new building was two stories in the front, with a one story portion in the rear. The buildings at 1113 and 1115 Pennsylvania Avenue, S.E., were connected on the interior and were completed in 1936. Wenig designed a store front sympathetic to Fealy’s next door; however, his commercial design was more influenced by the Streamline Moderne movement, popular at the time. The building is composed of the same brown brick in a running bond as Wilson’s building. The main facade, fronting Pennsylvania Avenue has four doors separated by storefront windows that project onto the sidewalk. Above the windows and doors is a simple, streamline metal awning that is continuous and tied back in to the face brick. Above the awning, in line with the main plane of the building, is a row of transom lights divided by decorative brick at the entrances. A devastating fire occurred on the evening of June 5, 2013 and gutted both buildings. determined to be structurally sound. As a large percentage of these walls and some defining architectural features, such as the structure of the store windows, brick designs, and awnings, are salvageable, they should continue to be treated as a contributing resource to the Capitol Hill Historic District. Source: Advertisement, "Architects Labor for City Beautiful: Architects of the National Capital," Washington Post, District of Columbia: February 24, 1907, page 51. The last major alteration to the buildings occurred in 1938 when Frager put an addition on in the rear of 1115 Pennsylvania Avenue, S.E., and made a cutout on the second floor in the middle of the building. Historic documentation and narrative provided by EHT Traceries, Inc.
Be among the first to explore this historic opportunity.